I've just started using TeamCity and have got a basic build running using Subversion, VS2010 build runner and NUnit. 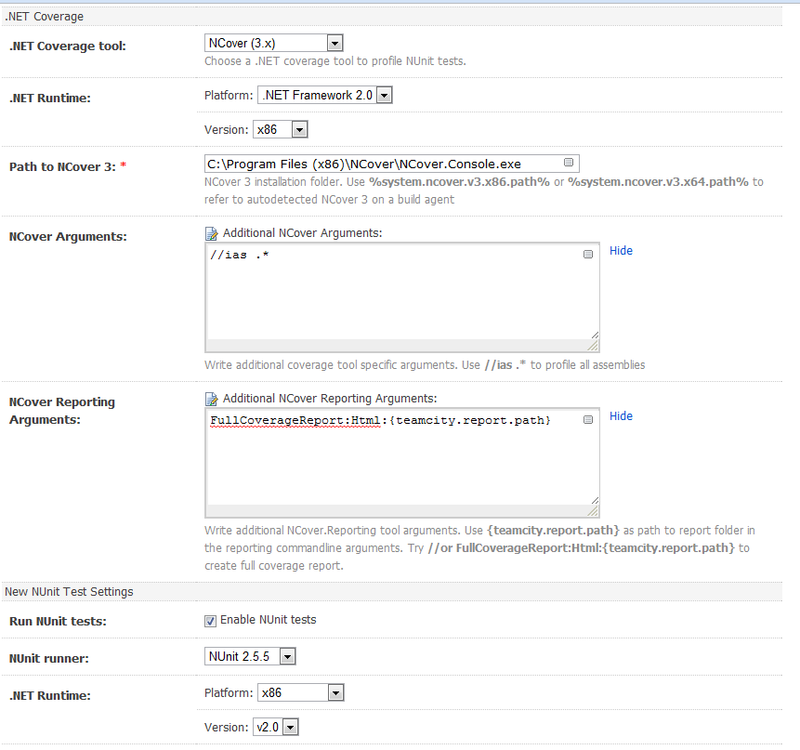 I have now added NCover to the build process and I can see from the log that coverage is being run but the html report is not being generated. I'm using TC 5.1.2. I've attached a screenshot of my build runner configuration. I've also googled for this error but could only find a reference to a problem with a rake build that didn't seem relevant. I'm wondering if it has something to do with the fact that the x86 install of NCover doesn't include NCover.Reporting (I'm compiling all my assemblies to x86 so am using nunit and ncover x86 versions). I've tried copying the x64 version of NCover.Reporting to the x86 folder but still get the same problem. I seem to have answered my own question. I had the path to NCover set up incorrectly, it was pointing to the console exe and not the folder.